A few of these NOS (new old stock) models are appearing today and for a collector like me are almost a certain buy. 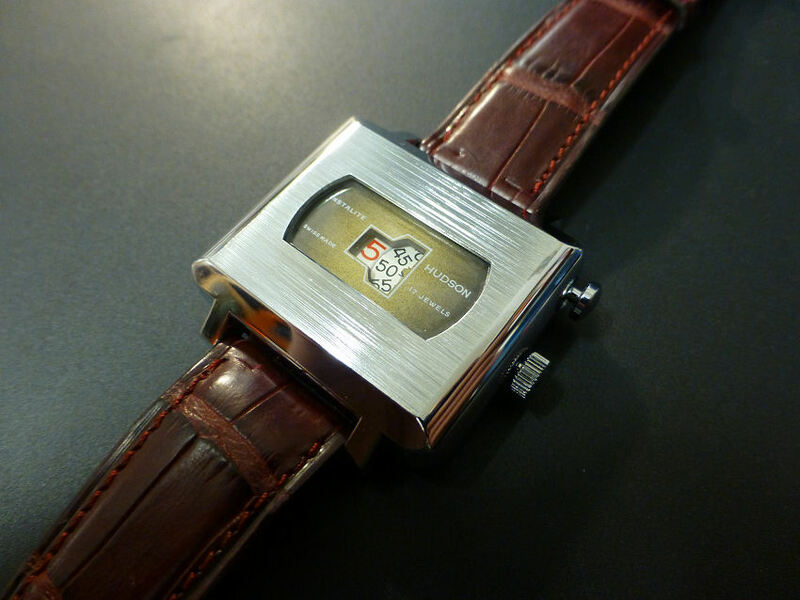 Watches like this from the 1970’s are slap bang in the middle of the worst period for Swiss watches as the cheap, accurate Quartz revolution from Asia hit them hard. Often the smaller Company or suppliers could move and adapt to not only compete with this new threat but importantly still manage to utilize their existing mechanical movements. 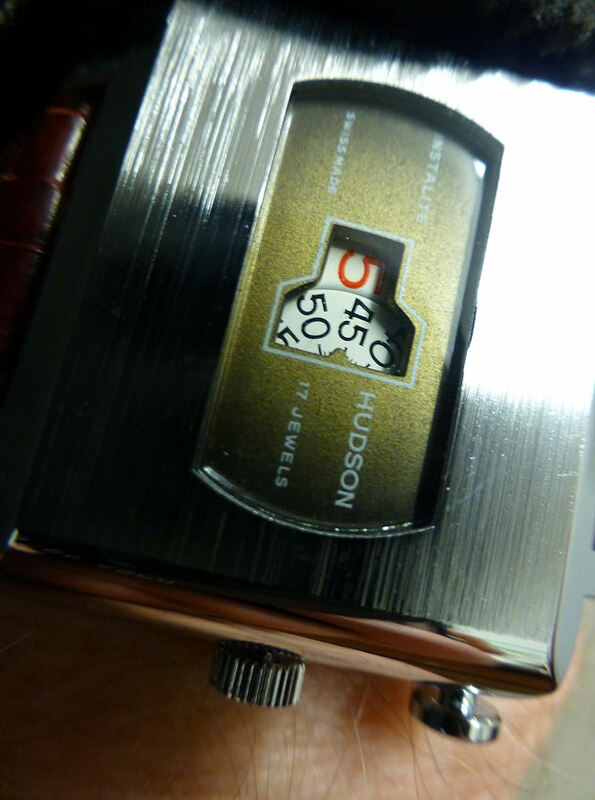 The Hudson Instalite (by Itraco) – 17 jewel pin lever “Jump” watch. 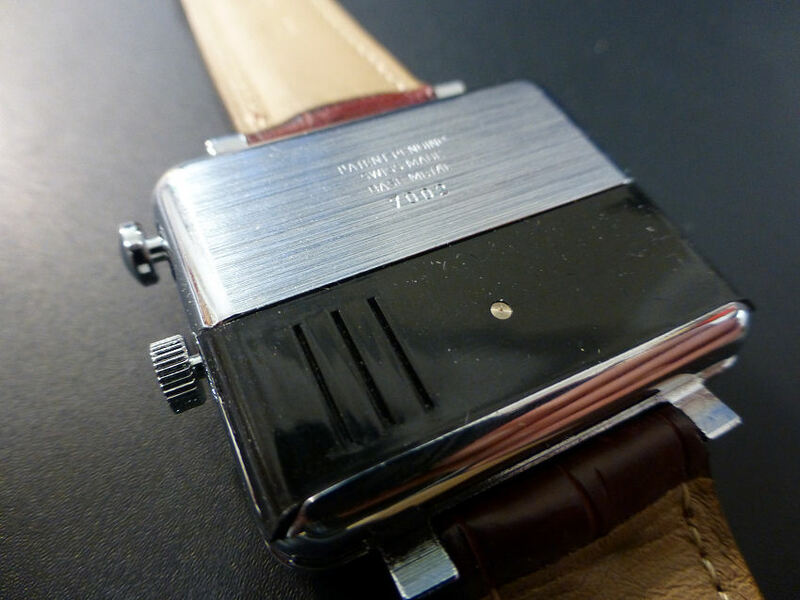 Hence the birth of the mechanical “digital”, Digit Wheel or “Jump” watch, which managed the appearance of a Quartz digital watch, but with a more or less conventional mechanical movement. Some were true “Jump” designs where the Hour digit only moved or “jumped” forward at the last second of the Minute Counter digit. Others sort of gradually slid into position as the changing of the Hour approached, though these often caused a little confusion when not fully changed, being sort of stuck in no-man’s land between hours. This model falls into this category – at the hour and 55 seconds, it’s sometimes tricky to tell which hour it actually is! Quite a few different Brands appeared at this time such as Gigandet, Damas, Lanco, Lasser and others. The model featured here was sold for retail by Hudson for the US market, though the Brand was actually manufactured by Itraco of Zurich (Itraco, Samba & Hudson) and features the Ebauches Bettlach EB8461 17 jewel pin lever mechanical wheel digit movement with a pretty decent 40hr reserve . The Hudson Watch Co. was registered by Antoine Castelberg of Chaux-de-Fonds and New York in 1884. Other names were marketed via Hudson in the early 1970’s, such as Adelphi, Carlton, Gisa, Globe, J Godat Geneve and others. In fact the list of “lost” names and Brands is extensive and to be certain of who made what, or who sold what and under what name and where and at that time is a near impossible task. Suffice to say, this model is the Hudson logo’d Instalite model, which I consider one of the better ones. I have also seen the same watch with “Fashion-Time” and “Secory” and apart from slight cosmetic changes are obviously the same model. I understand that one of those variations did alter the movement to give that true “jump” hour and I have a feeling the movement was also an EB movement but calibre 8481 series. The battery access for the “Instalite” accessed via this left sliding hatch. Access to the movement requires the back removed. The “slots” are simply grips to assist in sliding. The term “Instalite” is in reference to the battery powered dial light which illuminates the dial digits rather well in this case and operated via the push button @1 above the central crown. The battery is easily accessible via the dark colored plastic sliding rear cover, which is separate from the movement, which itself can be seen only with the entire 2 piece metal “snap” back removed. Various movements from Ebauches Bettlach were used in this model depending on the year, but all are similar in operation. It’s fair to say Bettlach E after amalgamating many of the independent Swiss makers as a defence against the Quartz revolution, were focused more on the lower end. Historically Ebauches Bettlach SA was formed in 1926 and ended in 1980 as it finally merged into the Swatch Group under ETA, which aligned pretty much with Bettlach’s core aim from it’s inception. ( for details see under – https://www.watch-wiki.net/index.php?title=Ebauches_SA ). Fits the wrist pretty well and very readable too. I have fitted a complimentary leather strap. I have a few of these “jump” models, as for me they represent an important yet too easily forgotten milestone in the Swiss watch history – and many are rather unique and cleverly innovative for the time. They really provided a stopgap rescue for much of the Industry at a time where the Swiss Watch industry as a whole was under serious threat. I hope the images show to best advantage, these intriguing watches which by the way are a delight to wear. The size is ideal and they sit well on the wrist, even an average one such as mine (6.5″). This watch came with an after market steel mesh bracelet, but if you read this site regularly you will know I just love changing straps and bracelets to see the effect. It can sometimes make or break the wear-ability and often is surprising, which is half the fun! 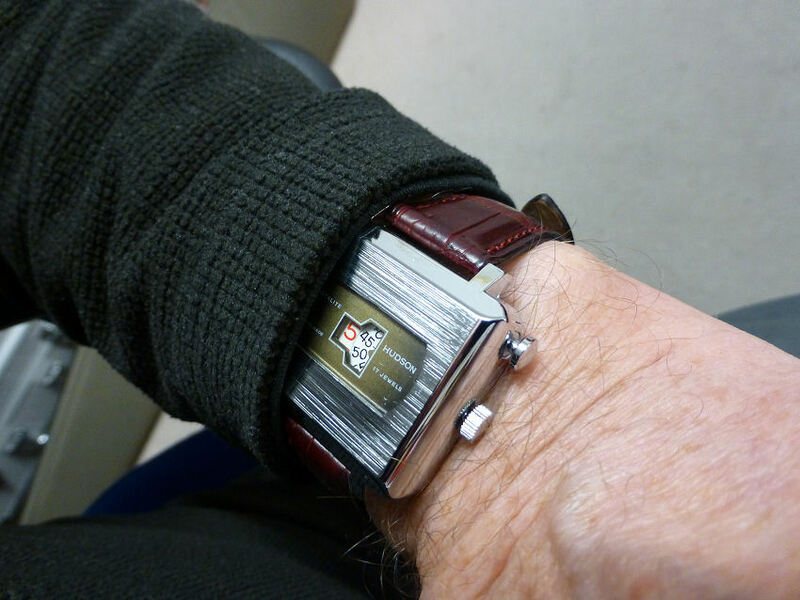 As shown I have fitted a brown leather strap which softens the look and for me is more comfortable.